The handsome, stately kudu is so revered that it serves as the logo for South Africa's National Parks Board. Greater kudus have slender, long bodies, short tails and white stripes along the side of its body. It is best identified and distinguished from other antelope by its long, heavily curled horns, its brown coat of fur and its big ears. Both males and females have the same color fur and build, although females are a bit smaller and do not have horns on their heads at all. Their horns are some of the most magnificent found among African antelope, and go grow to a staggering 72 inches or 182cm in length, despite them being so heavily curled. Greater kudu bulls usually weigh between 200- 270kg (440 – 600lb) with cows weighing between 120 –210kg (295 – 460lb). Their life expectancy in the wild is around 8 years of age. Greater kudus are found extensively throughout Southern Africa, in South Africa, Botswana, Zimbabwe, Namibia, Mozambique and Zambia and even further north in Tanzania, Kenya and parts of Angola although the populations in some of these areas aren’t always that big. In the Kruger National Park they can be found in any of the woodland areas or Mopani forests. Woodland areas can be found just south of the central grasslands where there are more trees and less open space, while the Mopane forests of the Kruger fall near Mopani rest camp. 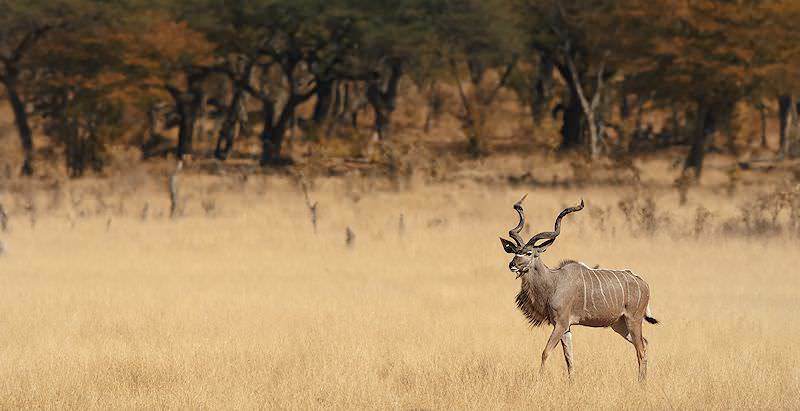 Greater Kudus have frequently been spotted enjoying the patchy shade of Acacia trees, shielding them from the hot African sun, feasting on the leaves of small shrubs and other trees as if they were a green delicacy. Woodland, savanna and arid-savanna areas are exactly what is being described here in this wondrous, picture perfect extract of the lifestyle of these big-eared antelope as they graze and browse by day. They share this space with many of their cousins, as well as some of their enemies out to make a decadent meal out of them. Kudus are non-territorial, and are actively in search of food, water and other necessities at any time of the day or night. They form herds, ranging from 5 to 20 individuals for female and offspring herds, while all-male or bachelor herds are usually much smaller, although most males remain solitary most of the year, only joining a herd during the mating season. Different herds give each other space during the rainy season when vegetation is at its peak and there is enough food virtually anywhere for any particular herd, but during the dry season when food is scarce, they may join up in certain areas simply because there is a food or water supply to support them. Although these creatures are not territorial, they have a certain area in which they live known as a home area. In the case of female and offspring herds, this area is usually 4 square kilometers in size, with bachelor groups’ home area much bigger, around 11 square kilometers. The power hierarchies in these maternal or bachelor groups, especially in the male groups or among males who battle over mates, goes according to age and the universal deciding factor, size. In the wild these animals rarely exceed 8 years of age before dying from natural causes or feeding whichever predator got their hands on the old fellow. Reproduction between kudu bulls and cows does not take place just anytime of the year, but rather during an allocated mating season, between April and May in South Africa for example. This is just another measure taken by the driving instincts of these animals to ensure a low mortality rate and a high survival rate among their calves. The gestation period of greater kudu cows is up to 9 months, after which the little calf will still depend on its mother for survival for another 6 months at most. This process will repeat itself when the calf reaches sexual maturity around 1 to 3 years of age, when it will mate and its offspring will go through the same circle of life. Kudus are plagued by many natural enemies, with lions, leopards, hunting dogs and spotted hyenas being able to bring down adult kudus while many species of jackal, some large eagles, cheetahs, brown hyenas and even pythons being able to bring down kudu young. They usually hide their young in the tall February grass for the first 5 weeks after birth as a precaution to better their chances of survival. When a herd is under attack from lions or other big predators, they usually run for it and hope that they aren’t the unlucky ones to fall victim to a bite of death. Travel to South Africa for a truly unforgettable African vacation. Botswana is an alluring safari destination, flush with wildlife and natural beauty. Travel to Namibia for a range of exhilarating desert safari activities. Zambia's top safari destination include Victoria Falls and South Luangwa. Mozambique is a tropical paradise with a multitude of far-flung islands. The Kruger National Park is an expansive wilderness tucked away in the lowveld of northeastern South Africa. The Sabi Sand Private Game Reserve forms part of the world-renowned Greater Kruger National Park in South Africa. Cape Town is a beguiling African vacation destination, offering a wealth of opportunities for both leisure and adventure. The Garden Route is revered for its lush natural beauty, rugged coastline and temperate waters of the Indian Ocean.